^ a b c Military Analysis Network, M249 Light Machine Gun. ^ Boe, David (1997年8月1日). “Mission Continues” (PDF). The Talon (Eagle Base, Tuzla, Bosnia-Herzegovina: 1st Infantry Division (Task Force Eagle) Public Affairs Office) 3 (31): p. 6. August 1, 1997. http://www.dtic.mil/bosnia/talon/tal19970801.pdf 2013年11月27日閲覧. "Sitting atop the platoon leader's HMMWV, the 20-year-old soldier mans a Squad Assault Weapon and monitors traffic at the crossroads." ^ Lewis, Jack (September 12, 2007). Ken Ramage. ed. The Gun Digest Book of Assault Weapons (7th ed.). Iola, Wisconsin: Gun Digest Books. pp. 14, 74, 156, 245. ISBN 978-1-4402-2652-6. http://books.google.com/books?id=HyF_GKQdPXgC&pg=PA14 2013年11月27日閲覧. "When it comes to machine guns, FNH USA is turning out copies of the M249 Squad Assault Weapon (SAW) that has been in the US military inventory for several decades." ^ a b U.S. Army 1992, A-1 Rifle platoon. 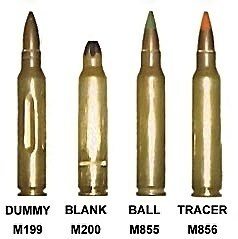 ^ a b U.S. Army 2003, 7–9 Automatic or burst fire. ^ a b c d Bonds and Miller 2002, p. 451. ^ U.S. Army 1994, Preface.